The Old West End Historic District is an area of roughly 28 city blocks located on the west edge of Muncie’s central business district. The area is largely residential with some commercial uses along State Road 32 (West Jackson Street) and Liberty Street. Structures in the district represent a range of architectural styles dating from the mid-nineteenth century to early twentieth centuries. The district contains the largest collection of late Victorian residential architecture in the city. The majority of the houses in the district were built between 1880 and 1915, during the “gas boom” era in Muncie. Muncie’s “west end” differed much from the city’s more fashionable “east end” in that many of its residents were descendants of early pioneers whose fortunes were made prior to the industrialized success of the late 1880’s. Many of the residences are large and elegant homes of frame or brick construction with extensive exterior details and embellishments. The Queen Anne style, and derivatives, are prevalent throughout the district, but the Greek Revival, Gothic Revival, Italianate, Foursquare, Colonial Revival and Bungalow styles are among the other late 19th- early 20th century modes represented. For more information about the history of the Old West End, please visit the Historic Muncie website at http://www.historicmuncie.org/history/. In 2015, a Ball State University immersive learning class under the direction of history professor Ronald Morris created an interactive website to share the interesting histories of Muncie’s founding families, gas boom barons and military veterans. Explore Beech Grove Cemetery includes about 50 biographies as well as bike routes, a list of monuments and a geocaching experience. Established 1841, the cemetery which is located within the Old West End neighborhood is listed on the National Register of Historic Places. 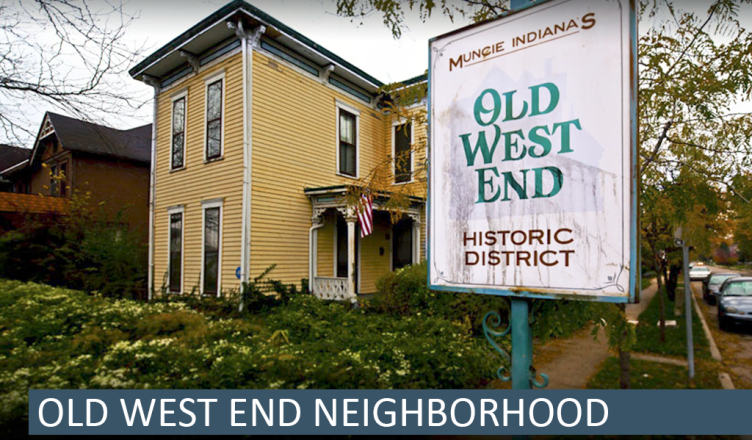 The Old West End neighborhood association meets every 4th Tuesday at 6:30 pm at the Friends Memorial Church, 418 W. Adams St., Muncie, IN 47305. All are welcome. In the fall of 2013, students from Ball State University’s College of Architecture and Planning under the direction of BSU Faculty member Lisa Dunaway, worked alongside residents to create the Old West End Neighborhood Action Plan (OWENAP). The student project won several prestigious awards, including the national American Planning Association’s AICP Student Project Award in 2014 and the 2015 Hoosier Planning Award for Outstanding Student Project. To learn more about the plan itself you may read the OWENAP narrative or watch this video created by Ball State telecommunications students. Find out what others think; rate and review this neighborhood on StreetAdvisor.